We do get some lovely colors in Bama! I don’t know what this bush is, but it was really pretty on our walk. When we were near it K ‘saw’ a lion who wanted to go with us on our walk. (She also rescued a zebra from the tennis court. The girl loves to watch cartoons about rescuing animals!) I told her the lion could walk with us, but he couldn’t come in the house. To live in our house he’d have to be willing to have his fur colored by K, the resident stylist. I’m not willing to chance it with a lion. Even a talking Alabama lion. We miss our friends and family much, but we certainly enjoy fall days like this at the end of November! Today is one of those days where I’m sick of being a parent. I’m sick of the constant need to be ‘on’, the never ending list of tasks, the need to volley between children (this one is crying, this one needs help, this one needs food, and all three need more attention and love than I have in me today.) And I’m sick. Which is really the crux of the matter. I’ve been sick for a few days and am tired of feeling lousy. I long for the days when I was single and could just hole up on my couch for hours, or if needed days, till I felt better. Now don’t get me wrong, if anyone were to take one of my children I’d rustle up the energy to do some major damage. I’m well aware my kids are an amazing gift. However, today I feel a bit whiny (and congested) and thought I’d get it off my chest. You ever have those moments? You dream of trading your life for a few minutes but you know you’d be devastated if you did. J wants me to hold him while he sleeps, K wants me to play with her, S wants me to listen to him. All reasonable desires, but not possible at the same time, especially when I feel lousy. So I’ll do my best, which ain’t so good today, and remember I have other days to make it up to them. Okay, I feel a bit better. I’ll take some meds for my headache and attack dinner. Hopefully the kids will cooperate…otherwise maybe we’ll enjoy pb&j tonight. And amidst the coughing and sniffling I’ll try to take time to enjoy my gifts. But I’ll might still dream of laying around. If you’re wondering what you’re looking at it’s a pile of dirty socks and pajamas. With some bunny slippers peeking out. I was sitting in the bathroom this week (in a place where I sit sometimes) and this was my view. I was struck by the cuteness of the bunny slippers. As they poked out of the laundry at me all I could think was how lucky I am. Granted I haven’t had a decent nights sleep in months and the most intellectual I seem to get these days is watching ‘Sid the Science Kid’ and studying fourth grade Alabama history. But I’m lucky. I have three amazing kids and a great husband. Apparently it was a melancholy day because as I was rocking J later the same day I was thinking again how lucky I am. I was rocking J and desperately attempting to sooth his colic. It can make for a frazzling evening when you’ve got a screaming infant and two other children who need attention, not to mention the meal that is half cooked. However, just a couple months ago J was in the hospital and I was apart from him every night. So rocking him, screams and all, is a gift. Life is a bit lonely for us in Alabama. It takes time to get to know people and build friendships, and it takes even longer when you have an infant (because you’re home a lot more). But we’re glad we have each other (most of the time). All in all, life is good. I have been blessed with a great family. Most days I want to keep them forever, though every once in a while I’d sell them cheap. I’m sure I’d change my mind immediately, so if you see my add on Craigslist, just ignore it. 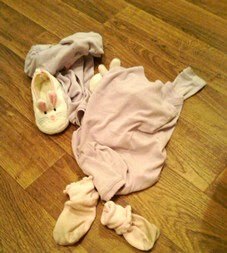 One look at some bunny slippers and I’ll melt all over again. 01 Nov 2010 Enter your password to view comments.